This could be a vintage year for wine investors who are seeking both growth opportunities and undervalued gems. The global equity markets were rocked by volatility last year and market observers are predicting more of the same this year. This has seen the alternative investment asset gain attention as a potential safe haven. The performance of the Liv-ex Fine Wine 1000 index easily beats many of the world’s equity indices over the short and long term. 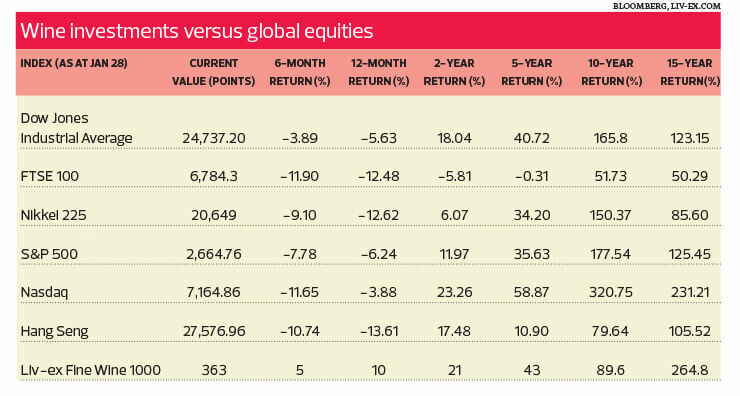 In fact, the Live-ex Fine Wine 1000 surpasses all major equity indices over 15 years, including the Nasdaq, the S&P 500 and the Dow Jones Industrial Average (see table). “We believe there is every reason to expect fine wine prices to continue to outperform. If equity markets rebound, it means global economic growth fears have lessened, which will lead to an increase in consumption of fine wine. 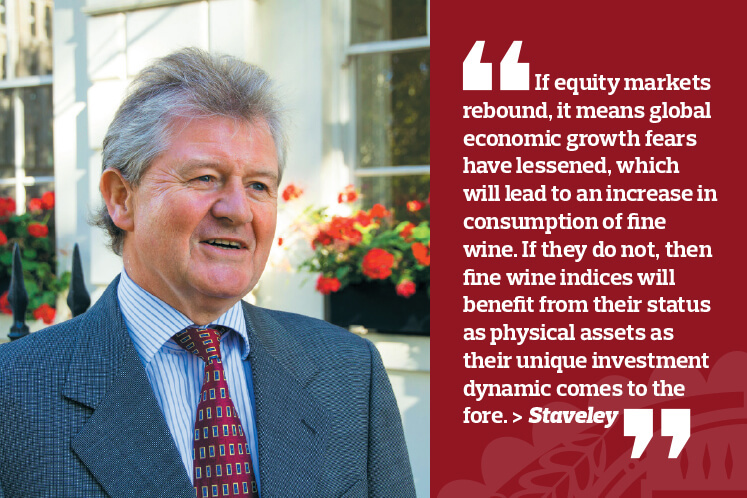 If they do not, then fine wine indices will benefit from their status as physical assets as their unique investment dynamic comes to the fore,” says Staveley. Sam Mudie, general manager of Cult Wines Ltd’s Singapore office, concurs. “The Burgundy market absolutely soared last year. The Liv-ex Burgundy 150 Index was up 35% last year alone,” he says. The supply of Burgundy is extremely limited, even more so than the likes of Bordeaux wines, a perennial investor staple. Hyper-low production levels protect the price of Burgundy, says Mudie. In fact, the last 10 years have seen record lows from the Burgundy region in general. “Production figures have been at their lowest since the 1950s. So, we are facing unprecedented demand at a time when supply is the lowest it has been in our lifetime,” he adds. “First Growth (the highest quality) Bordeaux estates for example, produce about 20,000 cases a year. Contrast this with even a value Burgundy grand cru — Clos des Lambrays from Domaine des Lambrays — which produces just over 2,000 cases a year. It is unsurprising then that two of the most expensive bottles of wine ever sold at auction are Burgundies. “Last October, two bottles of 1945 Domaine de la Romanée-Conti sold for US$558,000 and US$496,000 respectively,” says Mudie. Meanwhile, Bordeaux wines — a long-time darling of the fine wine investment scene — have lost market share in recent years. Mudie tells Personal Wealth that wines from this region have suffered a series of price corrections between 2011 and 2014, as winemakers added significant premiums to their yearly releases to take advantage of the booming demand coming out of China. “As an extreme example, five cases from any of the First Growths’ 2008 vintage, when released “en primeur”, would have cost around £8,600. Just a year later however, five cases of their 2009 vintage at first release would have cost in excess of £40,000; a price increase of over 365%,” Mudie explains. From its peak in mid-2011, he says a price correction within the First Growth estates was expected and necessary. Commonly referred to as “wine futures”, en primeur denotes the process of buying wines before they are bottled and released to the open market. Bordeaux wines are unique in that all the en primeur releases tend to be clustered around a particular week in April or May each year. En primeur offers investors the chance to purchase wines at the lowest market-offer price. According to Cult Wines Ltd’s website, prices of en primeur wines can sometimes double in a matter of weeks. Profit margins can be high, with multiple opportunities even before the wine is bottled, for savvy investors to take advantage of price increases and take profit. This time, however, Bordeaux wines would struggle at the various En Primeur Weeks over the next few years. Collectors and investors were suitably wary of large price increases, says Mudie. There was a silver lining of sorts, however. “First Growth Bordeaux estates, which are tracked by the Liv ex-Fine Wine 50 Index, lost close to 40% in value between June 2011 and June 2014. The wider Bordeaux market, tracked by the Bordeaux 500, only lost less than 20% over the same period,” he says. This means there are choice investment-grade but undervalued Bordeaux wines available on the secondary market right now. “I think the 2014 vintage came at the perfect time. Broader global markets were finally starting to turn positive,” says Mudie. In addition, investors should take into account currency fluctuations when deciding where to buy fine wines from. 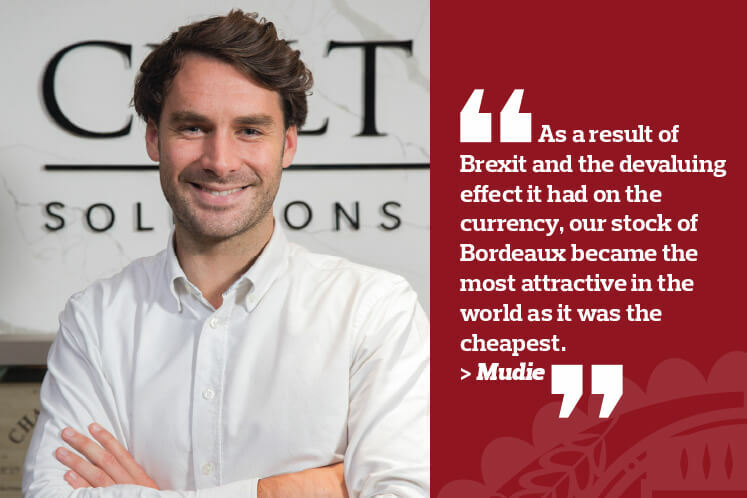 “Shortly after the release of the vintage 2015 Bordeaux wine, which took place in the spring of 2016, came the Brexit decision. London is the fine wine hub of the world, so naturally, everything is denominated in pound sterling,” says Mudie. According to Amphora’s Staveley, the fine wine secondary market is also denominated in pound sterling. So, anything that weakens the currency tends to be good for fine wine prices, seeing that much of the active buying from abroad is denominated in US dollars and the euro. “British Prime Minister Theresa May is currently struggling to come to a workable agreement on Brexit that it is difficult to see anything beyond a flat or weaker pound sterling for the foreseeable future,” he says.